The C$6 bln manufacturer is showcasing its long-delayed and over-budget CSeries jets at the Paris Air Show this week. Orders and cancellations there are often important. For Bombardier, which is listing a slug of its more profitable rail unit, the stakes may be even higher. 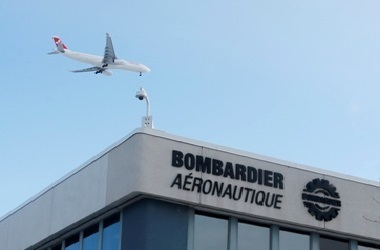 A plane flies over a Bombardier plant in Montreal, January 21 2014. The Paris Air Show takes place June 15 to June 21. Bombardier Chief Executive Alain Bellemare said on June 8 that the event is “not that critical” to the success of the company’s CSeries jets. He didn’t say if Bombardier is expecting to announce new orders at the show. The 110-to-160-seat aircraft, due to enter service next year, is Bombardier’s first product that directly competes with the 737 and A320 planes from Boeing and Airbus, respectively. Brazil’s Embraer, China’s Comac and Russia’s Irkut and Sukhoi also sell rival products. Since announcing the project in 2004, Bombardier has only logged 243 firm orders for CSeries planes, with another 179 options or rights-to-purchase. The Canadian company has said it aims to have 300 firm orders by the time the aircraft enters service.